Four-times world champion Foster produced a confident display in the final to beat the talented Martin Williamson of Ardrossan 21-14, having coped with the early pressures of a 7-4 deficit after six ends. Hopes that Dougie Berwick of East Lothian could spring a surprise in the event failed to get off the ground as he crashed out to a 21-5 defeat in 18 ends against Williamson in the semi-finals. Elsewhere, experienced internationalists Thomas Mann and Calum Logan of the host club crashed out 2-0 to Colin and Jason Banks of eventual beaten finalists Garioch in the last four of the 2Bowl Pairs, outscored 9-5, 10-5 on their own carpet. Jack Macnab put up a strong show in the Junior Singles where the budding Midlothian star recovered from 10-1 down to be in with a fighting chance at 19-19 but he bowed out to the 1,1 finish delivered by Mark O’Hagan of Blantyre. O’Hagan lost out 21-15 to Aberdeen’s Andrew Thomson in the final. The final of the ladies Singles saw Caroline Brown of Blantyre make an explosive start to lead 17-4 after nine ends against Claire Johnston of Auchinleck before clinching a 21-11 victory in 18 ends. Lisa Barret had carried the hopes of West Lothian IBC but the young internationalist suffered a bad experience in the shape of a 21-3 semi-final defeat in 13 ends at the hands of Brown. Carla Banks of Garioch motored from 8-5 down to 16-8 up in the final of Ladies Junior Singles and went on to capture the title with a 21-10 win over Emma McIntyre of Dumbarton. 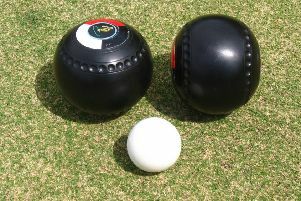 Kim Hoggan of East Lothian operated mostly on the back foot in her semi-final clash with Banks and suffered a 21-12 defeat in 20 ends.